From the creator of DigiCharat! Kotarou Higuchi (樋口湖太郎 Higuchi Kotarō) is the main character of Pitaten. He generally looks after himself, and lives alone with his dad- his mother died while saving him from being run over by a truck. In both cases, Kotarou learns new skills and becomes much happier as Misha lives with him, and he finally gets into the school of his choice with his friends. Manga — In the Manga, Kotarou starts as a reasonably intelligent child who is a little depressed. His emotional status is chiefly due to the aftereffects of his mother's death in a traumatizing road accident during his childhood. He loses self-esteem and faith in his abilities; closing his heart out to others and growing angry and pessimistic frequently. He likes to think that he's mature and responsible, but in reality he is rather recessive and has a lot of growing up to do. He falls in love with both Shia and Misha, but eventually has to give up both of them in the end. He has 1/8th of demon blood (his mother was 1/4th demon, not his father) and as such he is more than capable of seeing angels, demons and anything supernatural- although he ironically loathes this ability. His final wish from Misha is to not have this ability any more, and as such he can finally live in the real world. From all of Misha's care, devotion and love he finally learns to be truly happy, and learn to go through problems head-on, instead of hiding or growing frustrated. He is also the reincarnation of Misha's beloved 'Kotaroh', her main reason for giving him all her attention and concern. Anime — In the Anime, Kotarou starts out less successfully in school, and is still rather depressed. He is mature and responsible despite his young age, and keeps his feelings locked away as best he can. He sees Shia as a motherly figure, and seems to have a crush on Misha by the end of the series. He can see angels and demons, but it is not explained why (one can only presume he is only 1/16th of a demon here, although it isn't explicitly stated). By the conclusion, he has become much happier than before and as a result he copes much better at school. Misha is an apprentice angel, and has been for some time now. She speaks like a small child ending almost all of her sentences with -su, a shortened form of desu (which roughly translates as what do you think? ), and tries her very best to make everybody around her happy; consequentially making matters worse. She moved in next door to Kotarou to live, and has always been very hyper and outgoing around him (for example, her first line said to him in both versions is "Will you go out with me?"). She has always been happy and optimistic, and has always managed to keep a smile on her face even if she is depressed or unhappy. Manga — In the Manga, Misha was alive long ago -as angels age at a different rate than humans. Misha held a tragic past as well. As hinted from volumes prior to the semi-conclusion; Misha originally knew Kotarou's grandfather, who was also named Kotarou (but will be henceforth referred to as Kotaroh). When she was an apprentice angel, she used to habitually visit him every night, speaking to Kotaroh in formal Japanese - which annoyed him no end, so eventually she decided to talk like a small child and lose most of her formality. When she was severely punished for meeting Kotaroh, Misha was forced to agree to stop her nightly visits but Kotaroh, hearing of this- did not want to be alone again and in an attempt to be with her, committed suicide. Blamed for causing Kotaroh's death, Misha was imprisoned and forced to wear garments in black, and was confined in a jail of thorns for many years to come with feelings of guilt and sadness. Eventually, Kotaroh reincarnated himself into the present Kotarou and Misha was granted permission to set up lodgings near him and 'help' him -at which she immediately searched him out and sincerely tried to make him very happy. (Even though Kotarou has no recollection of ever being Kotaroh and thus did not recognize her). Misha's final try at passing her exam was to make Kotarou happy; which she eventually achieved- it is implied that she was accepted as an angel and finally allowed to wear white. It is interesting to note that nobody actually realised she is an angel except for Nya, Shia and Kotarou, even if they assumed all her weird actions were merely part of her oddities. An extremely strong, happy and determined girl, she is generally innocent but very benevolent and forgiving. She most likely knew of Shia's true identity but simply did not mind, she also knew Shia nearly killed Kotarou -and in more than one occasion-, but still allowed the other woman to live with her and was also determined to become Kotarou's mother upon realization that he had no mother. Shia is a demon (manga) or a demon apprentice (anime). She is, gentle, kind hearted and isn't very good at being malicious or killing humans. She's generally weak all around, even more so when her staff becomes broken under Misha's influence. Manga — In the Manga, Shia is older than Misha. She was friends (eventually lovers) with Taro Higuchi, Kotarou's great-grandfather at age six (physically). Shia was adopted by a family as a very small child when she was abandoned, and named Shima after she cried that out every night in her sleep (she was actually crying out her real name, Shia, although Taro and her adopted family still referred to her as Shima). Shia, as a child, caused bad luck everywhere- and it took Taro some time to teach her that she wasn't a demon and a jinx (although, in actuality, she was). When Shia (as a child) was getting close to death she was taken from the human world by Nya, who taught her that she had to drink blood to sustain herself, and that she would need at least some human blood as that was the most powerful (she had only been drinking animal blood as Shima). Later, Shia departed from Nya again to go back to Taro (Taro was now a young adult, while Shia still looked like a child). Shia and Taro got back together and eventually fell in love, producing two offspring, Kotaroh (Kotarou's great uncle) and Shino (Kotarou's grandmother)-- that makes Shia Kotarou's great-grandmother. As Shia refused to drink human blood, she became steadily weaker until she attempted to kill Kotaroh for his blood (he never realised this was happening), so she went back to Nya and left Taro. Eventually, in the present day, Shia returned again to the human world to find Taro and her children again- Nya now accompanied her as a black cat. She found herself living with Misha as she had nowhere else to go, and became distracted with looking after Kotarou, who she felt a connection with. Eventually she found herself a part-time job and almost settled down, until Nya and a picture of Kotarou's late mother (who bore a strong resemblance to Shia's old family) reminded her of her mission and she left without warning. Kotarou and Misha managed to seek her down at Kotarou's great-grandfather's house. While there, Taro (Kotarou's great-grandfather) passed away in his sleep. Shino and Kotaroh (Kotarou's grandparents on his mother's side) had already died, and he stayed with his aunt. Kotarou and Misha found Shia and told her of this, and Shia realised that she had a family with Kotarou, Misha and all her new friends. Nya warned her of the consequences of leaving, but Shia refused and went anyway. However, Shia was very weak and died before they could even get home- she was never resurrected and Nya took away her body. Kotarou only learned she was a demon after she had left for Taro's house, when Sasha informed him, Misha already knew but just didn't care. Shia is very gentle, loving and holds a motherly figure, she was the one who calmed down and helped Takashi, care for Kotarou as his own mother did and although she passed away, she holds a place in the hearts she helped. Anime — In the Anime, Shia had a considerably less complicated past! She came to earth as a demon apprentice, and Nya played the part of her mentor. Shia got a part-time job in a restaurant and cared for the children like a mother, eventually taking the place of Kotarou's mother. After helping children in a local hospital, Shia and Nya both realised that she could never be evil- and Shia was erased from the universe by the other demons. All but Misha forgot about her (as Misha is an angel), and eventually Misha resurrected her (which caused Misha to be deleted from the universe for doing so). By the end of the series, Shia was a human (she was resurrected as a human rather than as a demon apprentice), and continued to happily work her part-time job. Uematsu, Ten, Misha and Kotarou learned that Shia was an apprentice demon early in the series, when she absent-mindedly told them- Sasha found out when she first laid eyes on Shia. Takashi is an extremely intelligent, sporty and attractive 'ladies man' who is the best friend of both Kotarou and Koboshi since they were six. Despite his perfect grades and popularity, he has a troubled home life. His father is bedridden in hospital, and his mother spends a lot of time taking care of the two of them and paying for the hospital fees- as such, Takashi's family doesn't have much money, consequently leading to Takashi being unable to take the Exams to go into Joudai Academy (where Kotarou and Koboshi plan to go). Both he and Uematsu both take part in fun little tasks and every-day things in the anime and manga, so although they have large parts there is little about then that can be written. Manga — In the Manga, Ten starts his life seemingly happy and laid-back. He's constantly at the top of the class and never goes to cram school - but despite this, he secretly has to strive very hard to keep himself at the top. He gets love letters from many girls, since he is very popular-even if he rejects everyone of them. One of Ten-chan's many problems is that although he has the grades to go to a fantastic school in the following year; he just doesn't have enough money to pay for it. Even though his mother works hard in her job, and he gets a part-time job alongside Shia and eventually raises just about enough... the school rejects him outright. His second crisis is that he loves Shia. He is the last to see Shia before she finally leaves, although devastated he confessed his love to her there, pleading her to stay although she declined and left him there in the rain. After that, he never sees her again -as she passes away before they can meet again. He was also in love with Koboshi before Shia, but gave up on her because of her own affection for Kotarou, moving on to Shia when she appeared. A slight problem along the road had been that Kotarou had a crush on Shia too. Ultimately, Ten has to cope with his misery and he gets into his second choice school, away from his friends. Anime — In the Anime, Ten plays more as a background character. He's happy, and still in love with Shia, although he doesn't confess to her. To help his mother, he takes up a part-time job alongside Shia, and has to work harder then any of the other children. Apparently he has no bad home life in the anime. The fierce, petite blond-haired female childhood friend of both Takashi and Kotarou, Koboshi is depicted as a very assertive character. She loves Kotarou very much but is too embarrassed to confess her feelings to him. She enjoys having a normal, routinely basis of her every-day life from meeting Kotarou in the morning to talking to him during the day. Until Misha showed up. She wears unique cat-shaped ears everyday on her hair (but they're not real or actually attached to her head). She is liable to anger, and very overprotective, causing her to be constantly irritated by Misha's childish antics and attachment to her 'Kotarou-chan'. Koboshi and Takashi both take part in fun little tasks and every-day things in both the anime and manga, so although they may have large parts, there is little about them that can be written. Manga — In the Manga, Koboshi clearly loves Kotarou a lot. She tries her very best to impress him and be close to him; from learning to cook apple pies, only to have the pie to fall on his head, and confessing her affections only to be rejected in the end. She's cheerful and extravert, but eventually learns that she has a lot of growing up to do. By the end of the manga, she is still a cheerful person, but has abandoned her childish cat ears and is beginning to mature into a young woman. By the end she has also finally given up on Kotarou, choosing to be his friend rather than his girlfriend, and opening her eyes to other people now. Anime — In the Anime, Uematsu plays more of a comic relief part, from repeatedly shouting at Misha loudly to consistently punching Hiroshi in a comical sense. She works hard against Misha (whom she sees as a rival) to be the object of Kotarou's affection, and she has the advantage of being his childhood friend, and the girl he talks the most to. As a child, Koboshi defended Kotarou and protected him from those who bullied him because of his loss of having a mother. In the manga, he is nicknamed Dai-chan or 'Poops' (a play on the Japanese letters of his name), but other then that he is one of the few characters who is almost always consistent storyline-wise in both the anime and the manga. Hiroshi doesn't know that Shia is a demon and Misha is an angel; but he is strict and knowledgeable in traditional Japanese arts, so he is able to guess (often to the annoyance of the other three kids, when he attempts to exorcise Shia and clings to Misha). Despite this, Hiroshi works hard to stand up to his family name, the great Mitarai dynasty, but always falls behind Ten-chan in grades. He is a respectable character; with high aims and a strong spirit. He misses his first choice for education because of Exam grades (unlike Ten-chan, who got the grades but the school just didn't want him), and consequently ends up at his Elementary's middle school, Misaki Middle. In the anime version, Mitarai has an eagle called Jimmi, whom he can call with a whistle. Jimmy also shows up once in the manga. Shino is the name of Kotarou's cousin. She is a small child with a free spirit, but when she gets upset she gets upset very quickly and easily, plus she hates being left alone. She, like Kotarou, can see angels, demons and ghosts. Manga — In the Manga, Shino plays a reasonably large part. When she first appears, she is lost in an amusement park and Kotarou and Misha find her- she takes an immediate liking to Misha. However, Shino doesn't like Shia as she gets headaches around her (Kotarou too used to get headaches around Shia, reacting to her being a demon). In the Manga, Shino is 1/8th demon like Kotarou (following down the same like, Shia is also Shino's great-grandmother). It is of note that Shino and Kotarou's grandmother was also called Shino- she is seen when Kotarou goes to visit his great-grandfather's house and is also in the scenes set in the past- past Shino is portrayed as strong willed, rather like Uematsu in the present. After Shino's father is hospitalised (her mother is dead, like Kotarou's), Shino moves to live in with Kotarou. 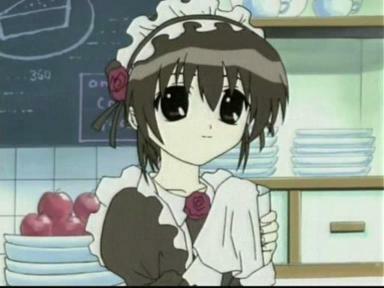 She makes fewer and fewer appearances as the series moves on and the action moves out of Kotarou's house, but she is never ditched from the cast page and appears in the last chapter. Anime — In the Anime, Shino hardly appears (not having a part on the introduction). 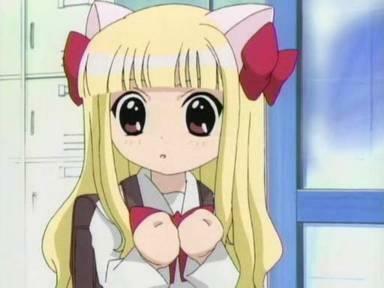 She has only two episodes to herself where she is a reasonably main character; she goes to the theme park and to Kotarou's school. It is said that Shino is staying with Kotarou until her own father gets better, so it is unknown if she's actually left after these episodes (they don't say goodbye), or if she's still there. Manga — In the Manga, Nya is a demon who seems to be quite fond of Shia or -to some extent- close to her. He often aids her from near-death situations, and tries to teach her how she can be a proper demon. Yet he gets easily frustrated by her incompetence and reluctance to kill humans. He's always depicted as an antagonist, with a long cloak and a sinister look in his eyes, but all he really ever does is protect Shia. It saddens him in the end that she would rather stay in the human world and not leave with him, which results in her death. Nyaa's human form has dirty chin-length blonde hair and cold blue eyes. He appears to have some German history, but his past is completely unknown other then the deep, unreasonable hatred he holds for mortals and his closeness to Shia. He is fairly tall and always dressed in a long black cloak -he wears a little bell where it would be around his neck as a cat- and he is clearly a very powerful and clever demon. Near the very end, he appears one last time to collect Shia's body and then disappears for good. Anime — In the Anime, Nyaa is only Shia's mentor. He tries to do the best for her, and although he tries to teach her how to be evil, she just can't (she's too kind and benevolent). Which makes him very frustrated and annoyed. Near the end it is revealed being evil was ultimately for her own good or else being wiped from existence and from the memories of those who knew her. After Shia is erased, it is clear that he loves her, and he works day and night in a fruitless attempt to have her resurrected (albeit Misha gets her resurrected in the end and Nyaa's potions just go to waste). Sasha is Misha's big sister, a full angel. In both the Manga and the Anime, Sasha tests Misha for her final angel exam. Manga — In the Manga, Sasha is a very strict and harsh character- who first appears in the third volume after Misha begins testing for her Angel Licensing Examination. She is a stern and up-right character who bullies Misha excessively into studying or concentrating on her studies instead of on Kotarou. It is later shown that the reason to this is because she knows very well what will happen to Misha if she fails her Angel Examination again. 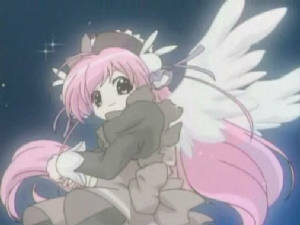 Sasha also holds a grudge against Kotarou for indirectly ruining Misha's reputation and chance to pass the Angel Examinations as well as imprisoning her for years. After that incident, Sasha repeatedly tries -in vain- to keep Misha away from Kotarou, as she knows that Misha is focused only on Kotarou, and consequently gets distracted from her studies. In an attempt to sabotage their friendship she forces Kotarou into a dreamlike state where he becomes Kotaroh (the first) temporarily and witnesses all the tragic events that lead to his death, and Misha's downfall. Even though Sasha did not fully manage to break their bond together; she creates disruption in their friendship and doubts, but also indirectly causes them to be reunited again. Eventually though Sasha's plan works out, and Misha does well on her Examination. (It is presumed that she passes because in the conclusion she is seen wearing white). Taro is the name of Kotarou's great-grandfather. He is a stubborn man and very down-to-earth, determined and bold from child to elder. As a child, he met a young girl called Shima (who was Shia)- who he tried hard to convince that she wasn't bad luck or different, and eventually succeeded in making her happy and becoming her friend. One day, Shima disappeared with Nya, and he was most upset. Several years later, Taro -a young adult- meets Shima again in Tokyo, where he was working and engaged. Although Shima looks physically 7 or 8 years old but she was mentally an adult; he married her and they had two children- Kotaroh and Shino. Even if they had unhappy moments and sad times, both of them tried to live together peacefully although in the end Shia -unable to control her demon instincts- nearly killed Kotaroh in her desperation and left with Nya, unable to bear it any longer. Before she left, Taro promised Shima that he would wait for her by the old apple tree no matter what. In spite, Nya erased Shima's memories and left with her. Though Shia was still haunted by the desire to see him and her family again for years to come she came far to late to meet her beloved Taro as he passed away. Taro for all those years waited in that house until he died for her to come back. Kotaroh was Misha's friend when she was a little girl, and also Taro's son. He was half demon, so he had visions of people's death. Yet when he tried to tell them of the approaching death - just to be helpful- they branded him as a demon who was causing the deaths, not predicting them. He was bullied terribly afterwards, and although his sister Shino stood up for him (she had rocks thrown at her for it), he found himself shunned and outcast. In spite of the treatment, Kotaroh still made a friend. Who happened to be the angel trainee named Misha, who he met by chance. She talked to him in formal Japanese, which annoyed him no end, so eventually she started to talk to him in a childish manner (which made him laugh, so she continued to do so). Kotaroh loved Misha dearly, and asked her to go out with him. However, Misha -being an angel, did not know what that meant- so Kotaroh explained that he wanted to be with her forever (this is why Misha asked Kotarou to go out with her in the present time on their first meeting). But what Misha was doing (visiting Kotaroh) was against all the rules in Heaven and she was scolded and ordered to be sent back to Heaven. After hearing so, he decided he would go to heaven with Misha, and suicided by jumping off a cliff to his death. Unfortunately, this caused Misha to be imprisoned in a tangle of vines for many years in repentance, for being with him and for driving him to kill himself for her. Misha lived many years in the prison with grief and upon hearing of Kotaroh's reincarnation, was sent down to finally make him happy.